Thank you for your visits to my blog. This is the last entry in 2018 and the first one in 2019 will be posted on the 2nd of January. I wish you have a happy new year. The life of SAIGŌ Kichinosuke (Takamori) was full of ups and downs. He who served SHIMAZU Nariakira and learned about the Western Powers from him. Then he became his pupil rather than his vassal and sacrificed himself for the lord of Satsuma. However he died suddenly when he was in Kyoto and he tried to follow him to the grave but was stopped by Gesshō. In the series, the scene is not described but he intends to save him from the execution in the Ansei Purge. But at last they are cornered and they committed suicide. Though Kichinosuke was saved and was exiled to Amami Oshima and met Aikana. they had two children one of whom was Kikujirō but Kichinosuke returned to Satsuma. After that he was exiled again and looked death in the face there. 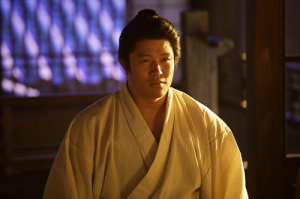 The experience matured him and then he decided to overthrow the shogunate and met some great figures such as KATSU Kaishū, SAKAMOTO Ryōma and IWAKURA Tomomi and they influenced him so much. At last he overthrew the shogunate and became one of those who realised the Meiji Restoration but he was not the man who was well adapted to the government. Miho Nakazono who writes the script of the series says in a guidebook of "Segodon" that she tries to make some characters be tossed about the storms in the life and become strong-minded and so is Kichinosuke. As I write in "My Impressions on Segoi-don 1", he is not described as a man who is very charismatic and has a thought strongly based on royalism as he really was or is described in "Tobu ga Gotoku". But he is a mysterious man and there may be many ways of describing him. 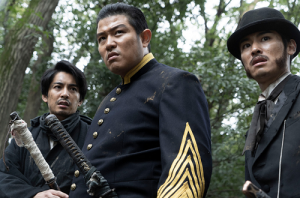 Yukinori Kida, one of the Senior Managing Directors of NHK says, "Though SAIGŌ Takamori was the main character in 'Tobu ga Gotoku' also, the way of describing him changes as time goes by". And I accept Nakazono's description. I stop posting the entries on "Sego-don" in English for a while but will post them related to the history of Kagoshima soon. The series describes the life of SAIGŌ Kichinosuke, later Takamori. And it really satisfies me. Needless to say, there are many fictional parts like other Taiga Drama series. 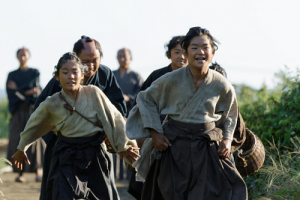 The series is characteralised by the description of Kichinosuke in his childhood. He is described as a young and inexperienced man in his early days and is confused with the death of SHIMAZU Nariakira who gave him an important position. SAIGŌ Takamori was originally a man who was one of the charismatic leaders in the Meiji Restoration and had a thought strongly influenced by royalism. However, describing a particular thought in TV dramas becomes to be restricted now because of political correctness. According to an article on the internet, the staff have to describe Kichinosuke as a man who supports the poor who gives them something without expecting anything to return unlike him in "Tobu ga Gotoku" that was broadcast in 1990. 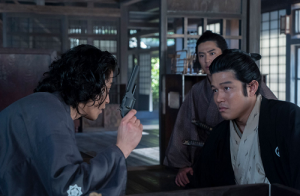 The article also says that Ryōhei Suzuki plays the role of Kichinosuke who is an ordinary man rather than a super star in Japanese history perfectly. Though some viewers are dissatisfied with it, this may be an another way of describing him. Personally I think he is a good actor and the very man for the role. "The Entertainer" by Scott Joplin that is the theme of "Sting" featured Paul Newman and Robert Redford. In the US, it was released on the 25th of December, 1973. The ragtime sound makes me feel excited.